Local deal goliath Groupon is launching a major new feature today: deal personalization, giving the site the ability to send you the deals it thinks you’ll be most interested in. 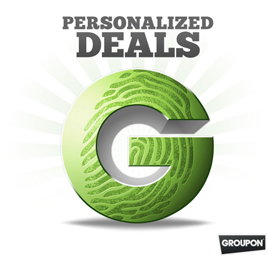 Before now, Groupon has always offered one or two deals per city per day to its users. That’s still going to be true, but with a twist: the site will be sending different deals to users based on criteria like their gender, buying history, and their interests. The change may sound fairly minor, but it will likely have a big impact on Groupon’s bottom line. Groupon’s simplicity has no doubt contributed to its success, but this is one case where it has some very good reasons for introducing a few extra options: personalization will help the site fend off the 500 clones that are gunning for it, it will allow Groupon to offer an unlimited number of deals, and the site can now offer deals from businesses located outside of large cities. Local personalization is rolling out to six cities for now (Chicago, Los Angeles, New York City, San Francisco, San Jose, and Seattle), with the rest on the way. Again, to users, this won’t be readily apparent. When you sign up you’ll be asked for your zip code and gender, and Groupon will also allow you to specify if there are any particular types of deals you’re interested in. But there’s a good chance most people will have no idea that they’re receiving a different deal than their neighbors — they’ll still receive their daily deal in their inbox, and there won’t be a button to see the dozen other deals that might be available in that city. Deals will be distributed based on a personalization algorithm (Mason said they hired someone from Netflix to build it). Of course, that could introduce a problem: you may ask a friend if they’ve gotten in on the latest Groupon, only to find that you’ve both got different coupons. To remedy this, Mason says that you’ll still be able to send any Groupons you receive to your friends. In addition to allowing for an unlimited number of deals, the new system gives Groupon more flexibility behind the scenes. First, it can allow companies to stagger their deals, offering it multiple times over the course of a few months to different buckets of users. It also allows the site to offer deals to businesses from smaller cities. Groupon has historically only offered deals to businesses in major metropolitan areas — San Francisco, New York, etc. But plenty of users who might sign up for San Francisco deals live in a suburb, like Palo Alto. Now Groupon can identify which users live in those suburbs based on their zip codes, and send them deals from businesses in Palo Alto. This is going to be part of a broader trend for the site, which is shifting from “What’s your city?” to “What’s your zip code?”. And all of this has one other nice side effect: the deals landing in your inbox should be more relevant to what you’re actually interested in.